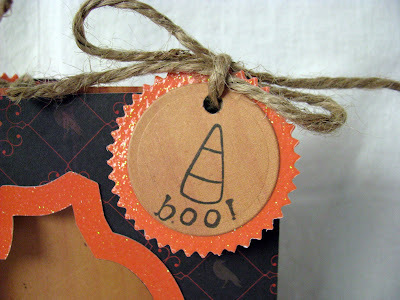 Scrappin' with DeeDee: Pumpkin Treat Bag and My Blog Candy Winner! 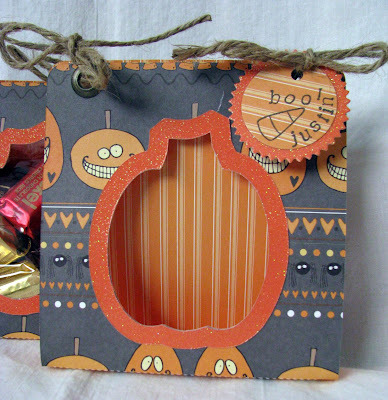 Pumpkin Treat Bag and My Blog Candy Winner! 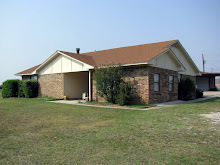 This is my final Halloween project for 2009. It's the Pumpkin Goodie Bag from The Cutting Cafe'. Although my boys are grown up, they still love candy, so I made them a goodie bag full of yummy chocolates. I used double sided papers so that even when you're peeking in from the side, it's still pretty! I also used some glitter paper for the pumpkin outline on the front of the goodie bag. I used my Nesties and few stamps out of my stash to created the tags. To keep the bags closed, I placed some big ole eyelets in each corner and then tied some twine through them for a closure. I thought that looked more boyish than ribbon did. 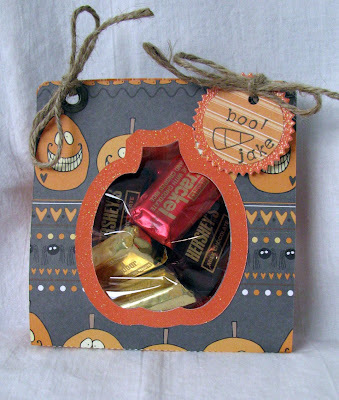 I used some of the little Stampin Up cellophane bags to put the candies in and then stapled them closed. These are really fun to make and easy too. 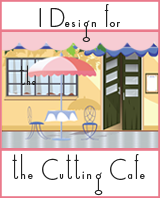 Regina offers the cutting files for your die cutting machine and also the PDF file for cutting them out by hand. Okay, now to the WINNER of my Blog Candy! I used random.org and the winner is #26, Patti's Scrapinings! YAY! 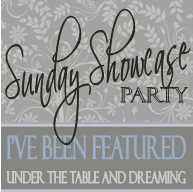 Please email me your snail mail address and I will get your goodies right out to you! Thanks for dropping by to see me today, please join me on Monday for a new Bitten By The Bug Challenge! HUGS! This is just super cute and I am sure your boys will love them. These are so fabulous, DeeDee!! I love them and they make such great treat bags! I'm sure the boys adored them! hugs! 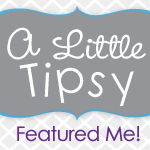 I just wanted to stop by to say Thank you for the blog candy!!! I never win anything until now, so you can understand the excitement. My family thought I was crazy because I was screaming:) I just love your blog and all the creative cards and crafts you make! You are awesome!!! Your pumpkin goodie bag is really cute. 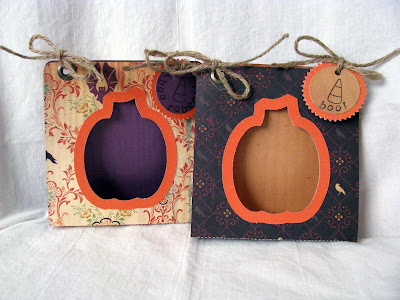 Great idea for Halloween decor and give-away.